Council Grove – Virginia Lucile “Ginny” Smith, 92, of Council Grove, Kansas, passed away Friday, May 12, 2017, at Diversicare of Council Grove. She was born January 26, 1925 in Los Angeles, California, the daughter of Arthur and Lucile (Boutelier) Hanson and the younger sister of her beloved brother, Capt. James Hanson, who was a highly decorated Navy fighter pilot and in later years, an airline pilot. Ginny was a very proud fourth generation “Angelino” as her father’s family were among early settlers of Los Angeles back in the 1800’s. She graduated from North Hollywood High School, attended two years of business school then took a job working at Disney Studios in Burbank, CA, in the mid 40”s. She then moved on to Lockheed Corporation, working as a secretary for LeRoy “Bud” Smith…whom she fell in love with and later married. He preceded her in death in June 2009. Bud and Ginny were responsible for the first major renovation on the Hays House in the 60’s. They also owned the Outpost Steakhouse for many years. Virginia also served as Head Librarian of Council Grove Public Library in 1967 and 1968. 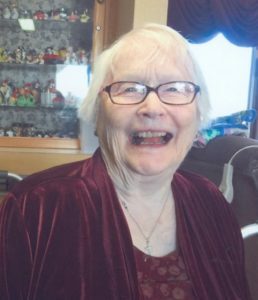 She was a member of Council Grove/Dunlap United Methodist Church; a member of Blessed Sacrament in Hollywood, CA, where she got the opportunity to sing with Cole Porter; and was an honorary member of C’oeur d’Alene Tribe. Ginny is survived by her son, Peter Smith and wife Mary Lois Douty, of Aurora and Copper Mountain, CO; daughter, Chris Garvey, of Scottsdale, AZ; and granddaughter, Robyn Sumners and husband Chad Bell, of North Hollywood, CA. A Celebration of Ginny’s life will be held at 11:00am, May 25, 2017, at Greenwood Cemetery. Memorial contributions may be made to Council Grove/Dunlap United Methodist Church and may be sent in care of Zeiner Funeral Home, PO Box 273, Council Grove, KS 66846.